A brilliant take on the Charles Dickens’ classic, A Christmas Carol, now set in modern times and re-imagined as the story of a TV executive. A wonderful movie, this one has the funny yet mean spirited energy of Bad Santa, the movie within a movie element of Tropic Thunder, and of course, a very modern take on A Christmas Carol. At the center of it all is Bill Murray, who absolutely knocks it out of the park as the title character. He plays Frank Cross, a man who is the head of the studio, and mean as hell. Cross is so cruel and ridiculous, that others who work for him can’t even believe a person like this can exist. Just witness the opening commercials and promotional spots he runs for the executives at the studio, to his live production of Scrooge (A Christmas Carol.) Pretty much everything about this movie works, including the cuts between the ghost appearances, visits to the set, and a romantic storyline that are all going on at the same time. Each ghost, including Frank’s old boss in the Jacob Marley role, is hilarious in a very different way. Carol Kane, in particular, steals the show as the ghost of Christmas past, but she’s one small part of a machine that is firing on all cylinders. Even the music in this film is fantastic. 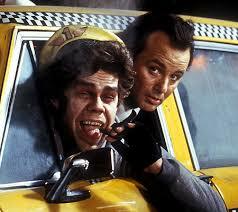 Scrooged is one of the best Bill Murray films of all time. It’s also one of the greatest Christmas movies. That’s because it is not only dark and creative, but it is also funny as hell. From the opening shots of commercials (Tropic Thunder style,) and promotional spots for different shows that the studio will be running around Christmastime, we are suddenly thrown right into the movie with all of it’s vicious humor. This thing is a beast that holds nothing back. It’s the inspiration for films like Bad Santa, only this one combines that element of a horrible person at Christmastime with the classic Charles Dickens story, A Christmas Carol. On top of that, the movie is also a behind the scenes look at the producing of a live broadcast of A Christmas Carol. So, in a sense, there’s that movie within a movie element going on here. On the one hand, we are watching the making of A Christmas Carol, and on the other hand, our main character is actually living it. And this movie also has the guts to really change key details from that original Dickens story, (for example, Tiny Tim is now a small black boy whose problem is not the he can’t walk, but that he doesn’t speak,) and yet still hits all of the basic formula buttons of the story, in one form or another. To understand why this movie is so great has to start with Bill Murray. He’s one of, if not the, funniest comedic actors alive. If you don’t like Bill Murray, there’s a really good chance you won’t like this movie, and that’s the sad truth. But Murray is a genious at comedy, as seen by his films Ghostbusters, Groundhog Day, What About Bob, Rushmore, and Caddyshack. Even his turn in supporting roles like Kingpin or Lost in Translation, were terrific. 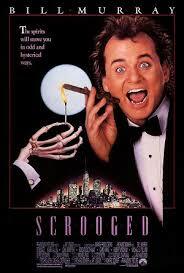 With Scrooged, his is given a sort of freedom that he has never really had before. The movie is rated R and for good reason. It means to offend. The Murray character, Frank Cross, is the most evil man you can imagine. When he sees a drawing that the son of his secretary made, hanging up on her wall, he tells her, “it’s crap,” and pulls it off the roll, rips it, and crumples it into a ball. That’s the kind of guy Cross is. The movie opens with a North Pole sequence that turns into a machine-gun filled massacre, complete with Santa, the elves, and masked men in ski gear. This is for a show of a raid on Santa’s workshop. What’s great is the amount of detail that’s put into it, taking it’s time to reveal that this is actually all part of a giant spoof. From there, Cross tells his assistants to run the Scrooged promo, and it begins with random people dying or killing each other in all sorts of ways. These ways are announced on the screen, with such terms as “acid rain,” and “road rage.” It ends with a line about A Christmas Carol and now is the time to remember the true meaning of Christmas. The executives in the room walk out with disgusted looks on their faces, some of them even vomiting. One of these executives, in particular, Elliott Ladermilk (Bobcat Goldthwait,) actually approaches Cross about the ad. He tells Cross that it is too violent and dark, to which Cross thanks him. No sooner does Ladermilk leave, however, and Cross tells his secretary, Grace, (Alfre Woodard,) to have Ladermilk fired. He even tells her to cancel the man’s Christmas bonus. When going through the presents with Grace, Cross insists on everyone getting just a towel from him. That includes his only brother. Grace is the Bob Cratchet character, from the classic Dickens story, and her son, Kevin, is Tiny Tim. Frank Cross is in the middle of getting everything ready for the live presentation of A Christmas Carol, which will air on Christmas Eve. There’s a lot to be done, and it all happens the day before Christmas Eve. Frank visits the set and helps decide on the costumes for the dancers. He wants them as scandalous as possible, and doesn’t care what the sensor person has to say about it. When she gives him a hard time, he ducks a swinging pole, and watches her get belted by it in the face. Meanwhile, Frank has to take meetings with Preston Rhinelander (the head of the studio,) and Brice Cummings, a man who works in the TV business in L.A. and who Preston has hired to work side by side with Frank. After visiting the set, and getting the meeting time for the next day, (lunch at noon on Christmas Eve,) Frank gets a visit in his office that night from a ghost. It’s a man named Lew, who was Frank’s former boss. This is the Jacob Marley role, and Lew was a man who Frank always looked up to for having tons of money. As it happens, Lew tells Frank that kind should have been his business. He looks like a worm feast, with a skeleton-like body and part of his head falling apart. Frank shoots him a bunch of times, only to see holes go into him while the man continues to have his drink. When nothing Lew says gets to Frank, including the notion that he will be visited by three ghosts, Lew holds Frank outside of the window, all those stories up. It’s a pretty terrifying look at the street. Before we get to the first ghost, we have that lunch time meeting, and it does not go off without a hitch. Frank sees an eyeball in his drink (a high ball,) and then he sees a waiter on fire. The whole thing is in his imagination, of course. When he leaves the restaurant and gets into a cab, he meets the ghost of Christmas past. This guy is a character, complete with giant laughs, cigar chomping mannerisms, and a shouting way of speaking. He takes no pity on Frank and brings him to all kinds of memories of his past. These include Frank as a boy, Frank meeting Claire (Karen Allen,) Frank and Claire exchanging Christmas presents one year, and Frank ditching Claire and breaking up with her, in order to have dinner with his boss and get ahead in the industry. After the ghost of Christmas past, we are back to the set of the live show, as they are doing rehearsals. We not only cut between the ghosts and this, but also have scenes of Frank and Claire thrown in there (he gets back in touch with her after the visit from Lew, and starts seeing her again,) and also scenes of Ladermilk, who has gone from a well-paid executive to a homeless drunk in about a twenty-four hour period. The movie does a fantastic job of cutting all of this together, including bringing Claire to the set of the show once or twice, bringing Frank to the homeless shelter where Claire works (which leads to him meeting a bunch of memorable homeless characters, who will reappear in the film later,) and having Ladermilk even visit the set by the film’s end. 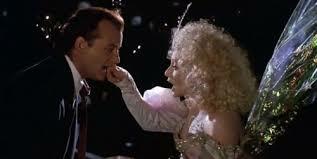 The second ghost is the ghost of Christmas present, and she is played by Carol Kane. This character is terrific. She is all about giggling and simultaneously causing a tremendous amount of pain for Frank. She hits him and knocks him around with anything she can find, only it’s not as part of a fight, but more as punctuation points to the different things she says, or that happen around them. So, whenever they need to change to a different location, for example, she finds something, like a toaster machine, to knock him over the head with. And he gets incredibly frustrated with her, naturally, causing a fantastic dynamic between the two of them. She is by far the best ghost in the movie, and has some really funny personality. Unfortunately, she only takes Frank to two locations, his brother’s place, and the home of Grace. Still, the movie manages to make it feel like a while, and gives Kane just enough time to be brilliant, without ever veering into the area of tiresome. The final ghost is the scariest, and the one who doesn’t say anything at all. He’s also the most gruesome, as can be seen when Frank opens up the ghost’s robe. The scenes this ghost takes him to are pretty horrific, including Frank being in a coffin, getting burned alive. It all leads to a fantastic ending, on the movie set, during the live production. There’s a lot to love about this movie, including how many different subplots it has going, all given their fair amount of time. For example, we get to know each of the other people in charge of the production at the studio. This leads to us getting the opportunity to watch the production live with Preston and his wife, at home, or to see Bryce and the head censor, who has a broken nose from something that happened earlier, now in the control room. And we know what each character cares about most. So for example, with Preston, it’s that dogs and cats appear on the screen more, so that dogs and cats who are at home, watching, will respond to it. This movie spins stories into stories, which is how we get Frank’s visit to the homeless shelter, leading to his meeting a man named Herman, only to stumble upon a frozen Herman later on that day. And the music is absolutely fantastic. It’s got this menacing, snowflake falling, Christmas music, that really says this is a nighttime movie, where you are going to be watching all kinds of crazy ideas, and may never quite be sure what to believe. The whole thing is really funny, dark, and smart as hell. What a great film.